Can Faithless Electors Deny Trump the Presidency? Subject: Can Faithless Electors Deny Trump the Presidency? Theoretically, faithless electors can still take the presidency away from Donald Trump and send Hillary Clinton to the White House in 2017. Donald Trump was declared the winner of the presidency last Tuesday by surpassing 270 electoral votes, the threshold for victory. While some votes are still being counted, Trump is expected to end up with 306 electoral votes. Faithless electors are the official voters in the Electoral College who vote against the wishes of their state. Even though Trump "won" 306 electoral votes, the Electoral College still has to meet and the votes still need to be cast by its actual members. According to the Constitution, each state legislature decides who will serve as electors for their state. In the country's early days, state legislatures chose their best representatives to choose the next president. Today, each state appoints its electors based on which candidate won the popular vote in their state (Nebraska and Maine are the only exceptions, and they appoint their electors based on which candidate won each congressional district in their state). This is why the media declared Trump last week the winner even though the Electoral College hasn't met yet. However, electors still have to cast their vote, and it is possible for electors to vote against their state's winner. Usually, the voting of electors is a mere formality. The political parties in each state choose the electors they'd like to send. When one party's candidate wins the state, that party's electors are who the state sends to the Electoral College. Since parties choose electors loyal to their party, it's very unlikely the electors would vote for a different party's candidate. Some states have even gone further to guard against the possibility of electors voting for a different candidate than expected. There are 24 states, plus the District of Colombia, with laws requiring electors to vote for the winner of their state's popular vote. But the punishment is limited to small fines. For example, Oklahoma's is a $1,000 fine for an elector voting for a different candidate than the one who won the state. Further, according to the National Archives and Records Administration, "no Elector has ever been prosecuted for failing to vote as pledged." Even with these safeguards in place, there have been 157 faithless electors throughout the country's history. In the last 17 presidential elections, there have been nine elections where faithless electors cast their vote for a different candidate, including the 2004 election. Will Faithless Electors Vote Against Trump? The Electoral College has become a last hope against a Trump presidency for many. A petition urging the Electoral College to vote for Hillary Clinton instead of Donald Trump has gotten more than 2 million signatures. However, the real threat to a Trump Electoral College victory comes from his own party, as these are the voters who could sway the outcome. 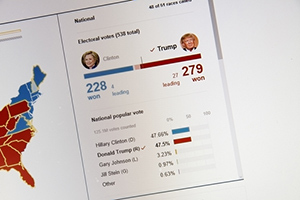 Robert Alexander, a professor of political science at Ohio Northern University who studies the Electoral College, explained on CNN that Republican electors could be unhappy with him. "Trump has angered many establishment Republicans throughout the campaign, and many of those same establishment Republicans will undoubtedly find their way to the Electoral College." In fact, the "Never Trump" movement originated among Republicans opposed to his nomination in the primaries. Alexander says it's possible for these Republican electors to vote for a different candidate than Trump, including his running mate Mike Pence or House Speaker Paul Ryan. In either case, while we have had faithless electors before, and we might have them in this election, the possibility of 36 electors switching their vote from Trump to Clinton, or at least 270 Republican electors agreeing on another candidate, is extremely unlikely. Such an event would create an unprecedented controversy. There have only been nine faithless electors in the last 68 years and there hasn't been more than one in a single election since 1912.
regarding Faithless Electors, i see no moral conflict for an elector to go with the popular vote over electoral based all or nothing votes. trump did not win the overall popular vote and this could be the turning point for fixing the electoral collage to better represent the popular vote. the founding fathers specifically tried to prevent an unqualified, demagog from spoofing the people into voting for him/her. trump fills that fear completely, trying to place a white supremest as the chief of staff should raise electors eyebrows as to what to expect if he is sworn in.